Do not mourn for me but allow the precious memories we shared together to brighten your days and bring smiles to your face. know that I am free. Our Mom Sylvia was born in Solvang California on January 23, 1920. She was the second daughter born to Anker and Esther Bredall and was graciously received by her sister Rosalie. Her brother Buddy joined the family a few years later. Mom used to laugh when telling the story about her and Rosalie were not happy with a new baby brother as they had requested a baby sister. She often shared stories about her beautiful childhood memories, running and playing in fields covered with wildflowers. After high school Mom attended Merrit Business College in Oakland and in 1939 accepted a job in Salinas. Her husband to be, and later our Dad, Gene worked upstairs in a different office. They were engaged in February 1940. During their engagement they both enrolled in a private pilot training course where they proudly accepted their pilots licenses on September 14, 1940. Two weeks later they exchanged marriage vows on September 28, 1940.
few women offered this opportunity and couldn't get to her assigned airfield in Douglas Arizona fast enough. Once there, she had many piloting duties including transporting military personnel from one airbase to another. This part of Mom's life was very special and exciting and she continued to be involved in the WASP organization until just a few years ago. Her passion for flying instigated her membership in the local Womans’ Pilot Club, the 99's. We are so proud to have the bragging rights that this honorable woman was our Mom. In 1945 a whole new chapter unfolded for Mom. In 1945, Elise was born, followed by Andy in 1946. In 1947 the twins Kathy and Krissy arrived. All four under the age of 3. We teased her often about her method of birth control and she would always smile proudly and proclaim it was planned parenthood. We are sure that her calm demeanor and patience was attributed to her career oriented life rather than a stay-at-home-Mom. As we grew up and had children of our own, our respect for her choice was fully understood. grandchildren and 10 great-grandchildren she knew all their ages and birth dates. This beautiful woman has left a legacy unequaled to any. Her kind hearted, generous, loving and caring personality was always present. Over the years she developed many dear friendships and had acquaintances all over the United States. At Christmas time it would take her days to write her cards as she remembered everybody and didn't leave anyone off her list. Connolly and Taylor, 4000 Alhambra Ave, Martinez, Ca 94553. Sylvia's online interview at scholastic.com. *I was born in January 10, 1920, in a homestead shack out on the Powder River, eight miles out of Broadus, Montana. Dad was trying to get the doctor, but it turned out he was out on call, delivering another baby. When dad got back, I was there. We moved to South Dakota, where mom was born, and from there to Mystic, South Dakota, a little sawmill town up in the Black Hills, where I grew up. I went to school at the Black Hills Teacher's College at Spearfish, South Dakota. During my last year we had the Civilian Pilot's Training, government sponsored to train pilots for the military. One girl to nine boys were allowed into the program. They had a ground school, and we were told the ones who got the best grades would get the chance to fly. They taught weather, aerodynamics, navigation, all classes that fit right in with my math and science. I was the lucky girl. I taught school at a small high school, not far from Spearfish. One of the fellows I flew with would fly over in his Cub and take me for a ride at noon or after school, landing in a hay field. As soon as school was out, I headed for Wichita to work in the aircraft factories. I was a final inspector for the Beechcraft Biplane, and getting in what flying I could in the Civil Air Patrol. Jacqueline Cochran was going to the larger cities getting names of women who wished to enroll in the WASP. Meriam Roby and I, from the Civil Air Patrol, decided to go to Texas, and get to see Jackie. We enlisted and were assigned to class 44-3. My assignment was Dodge City, Kansas to train on B-26's, but orders were changed. Doris Duren and I were sent to Independence Army Air Force Basic Training School for Air Force Cadets. We flew the North American BT-14s that were repaired, and flew non-flying officers on administrative duty. After deactivation, we were encouraged to apply for jobs with the Civil Service as Aircraft Communicators. We took training in Pacific Palisades, California. I was sent to Salt Lake City, Utah and then to Fairfield, Utah Radio. There I married my boss, Raymond J. Christiansen. I could not work under my husband, so I resigned. I joined the Church of Jesus Christ of Latter Day Saints, the Mormon Church, became active in doing genealogy work, and helping others to do it. I trained others to be teachers at the Family History Center, and am still involved in this work, mostly by internet now. Ray and I have six children. I was involved in Scouting for about 15 years where we started Cub Scouts in the Enoch-Parawon utah area. I was Area Director over the Cubbing for years. I recieved the 'Second Miler' award on April 9, 1973, another 'Second Miler' award on April 29, 1975, and the 'Silver Beaver' on May 11, 1976. All our children are happily married and we have 28 grandchildren, and **four great-grandchildren. In 2005, Marjorie was honored by the Arnold Air Society/Silver Wings Joint National Project with Wings Across America. Several cadets were given the opportunity to visit her in her home and to ask about her service and her life. They will remember this petite, gentle patriot-- as will all who were blessed to meet her. Marjorie Redding Christiansen passed away on September 13, 2008 at the age of 88 due to causes coincident with age. HANSEN, Mary B. passed away September 04, 2008. Visitation Tuesday, Sept. 09, 2008 from 3 p.m. - 8 p.m. at Green Hills. Funeral service 1 p.m. Wednesday, Sept. 10, 2008 at Green Hills Memorial Park and Mortuary 310-831-0311. This was the only official obituary I could find online. It was only released after paying a fee. However, that one paragraph is not the whole story by any means. 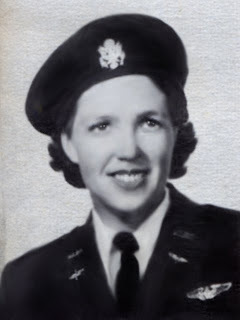 Mary was a unique woman who served her country as a WASP, and that deserves so much more. With thanks to WASP Betty Turner for her wonderful “Out of the Blue and Into History,” I can print Mary’s story--in her own words. Below is from p. 412. “I was born in Raleigh, North Carolina. My interest in flying began at an early age of nine years. My brother was in the Army Air Corps and he took me flying one day when I was about 12 years old. My hobby at the time was making model airplanes; I even made one of wire. I started flying at the age of 18, at a local airfield in Birmingham, Alabama. I took several classes in aeronautics, meteorology, and cross-country navigation at this time. I met the requirements for the WASP in the summer of 1943, and was interviewed by Mrs. Sheehy at Avenger Field, Sweetwater, Texas. I went to work at Avenger Field as an airplane parker in hopes of an early entry into the program. In a couple of months I was accepted into the Class of 44-6 on January 8, 1944. After graduation in June, I was stationed at Columbus, Mississippi flying engineering test flights on the AT-10 (twin-engine Beech). My second station was to be at Tyndall Field, Florida, going through B-26 school, but the decision for deactivation made such training unnecessary. I finished up the WASP program stationed at Freeman Field, Indiana flying the AT-10s. After deactivation I found employment at North American Aviation (now Rockwell) as a graphic artist illustrating the aircraft flight manuals. The manuals that I have worked on include: AT-6, T-28,F-86, F-100, B-25, B-70, and B-1, being manufactured at the Los Angeles Airport plant. It was there I met my husband, Vic Hansen, who was an engineer in the autonetics division. After 30 years I retired, my husband retired three years later. We have no children, so we did a lot of traveling to England, Scandinavian countries, Switzerland, Italy, Russia, Australia, New Zealand, South America, Kenya, Tanzania, China. We took various cruises: Caribbean, North Seas, China Seas, also Greece, Israel, Yugoslavia, Turkey and Austria, all a lot of fun. We also like playing golf. We have been living here in Rancho Palos Verdes, California since May 1959 and have no intention of moving elsewhere. We love it here. The WASP have a Southern California Chapter that meets quarterly and I am very active in it. I am now secretary of the So-Cal WWII. My husband and i try to attend most of the national conferences. 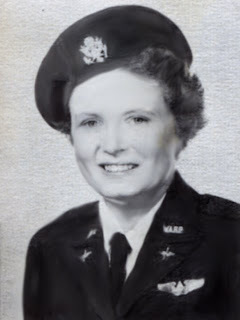 WASP Edna Harrison Atkins passed away Feb. 2, 2009 in St. Cloud, Florida, where she had lived for many years. She was born March 20, 1912 in New Windsor, New York. Her first flight was "more or less on a dare" with her husband, Joe Harrison. She and Joe met near Newburgh, New York and traveled all over the United states, working at approximately 20 major newspapers. 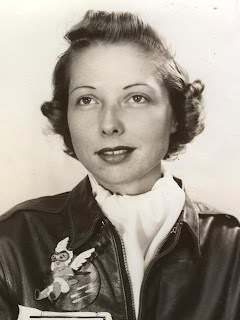 After soloing and receiving her private pilot license, Edna applied for and was accepted into the Army Airforces Flight Training program at Avenger Field, Sweetwater, Texas. 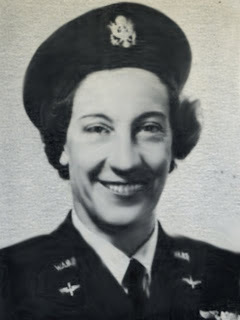 She entered the WASP as a member of class 44-6, and graduated in the summer of 1944. She was stationed at Buckingham Army Air Base, Fort Myers, Florida, where she flew the B-26 Martin Marauder (twin engine bomber) as a tow target pilot until the WASP were disbanded in December of 1944. After deactivation, she returned to the printing trade as a line type operated, continuing flying on the side until 1952,. Her husband, Joe, died in 1954. Edna remarried in July 1964 to Ewing M. Atkins of Rossville, Georgia. She and her new husband moved to St. Cloud, Florida in 1988. Ewing died in November of 1996. Edna is survived by several nieces and nephews. Like so many WASP, Edna served her country--doing what needed to be done--and then returned to her life before WWII. She is one of those who sacrificed much that we all might be free. God bless Edna -- and God continue to bless the country that she served. posted by Nancy Parrish--from p. 407, WASP Betty Turner's "Out of the Blue and Into History."